Goal: To introduce students to the use of UV/Vis spectroscopy in analytical chemistry. Identify the components of a UV/Vis spectrophotometer and the functions of each component. Preparing a suitable set of calibration standards. Measure absorbance of solutions at the specified wavelength. Apply the Beer-Lambert law and absorbance measurements to determine concentration of a coloured species in solution. Construct and use calibration curves to determine the concentration of an analyte in the analytical solution. There is often a direct relationship between the intensity of the colour of a solution and the concentration of the coloured component (the analyte species) which it contains. This direct relationship forms the basis of the colourimetric technique. One might readily determine the concentration of a sample based on its colour intensity, simply by comparing its colour with those of a series of solutions of known concentration of the analyte species. In some cases the colour of the solution may be due to an inherent property of the analyte itself, for example, a KMnO4 solution has a natural purple colour, the intensity of which can be readily measured. In many other cases, however, the solution colour is developed by the addition of a suitable reagent which interacts with the analyte species thereby forming a coloured complex. The amount of electromagnetic radiation in the visible region of the spectrum absorbed by a coloured solution is often directly proportional to the concentration of the coloured species as defined by the Beer-Lambert Law, A = εcl. which states that the absorbance of a solution is directly proportional to its concentration, c, as long as the solution path length, l, and the wavelength of measurement are constant. Once the Beer-Lambert law is obeyed, a plot of absorbance against concentration will give a straight line, the slope of which is the molar absorptivity, ε * length. Colourimetric techniques are useful in the analysis of a wide range of substances. One important application is its use in determining the phosphate content of natural and wastewater sources. Phosphate is considered to be one the most important nutrients in natural water. Although several other nutrients (eg. carbon, nitrogen, sulfur, potassium, calcium and magnesium) are required to facilitate growth of plant material, particularly algae, the phosphorus content is critical in determining the level of algal growth that the water will support. The growth of algae in natural water will rarely occur at phosphate concentrations below 0.05 mg/dm3. Drinking water may have a maximum allowable phosphate content of 0.3 mg/dm3, while on average, raw sewage contains about 30 mg/dm3. The phosphate found in natural waters mainly exists as the orthophosphate species, PO43-, however, the polyphosphates P2O74- and P3O105- are frequently encountered. These polyphosphate species may be hydrolysed to produce the orthophosphate, however, the species which dominates will depend on the pH prevailing in the particular environment. Phosphate will readily react with ammonium molybdate in the presence of suitable reducing agents to form a blue coloured complex, the intensity of which is directly proportional to the concentration of phosphate in the solution. The phosphate content of an unknown water sample can be obtained by first plotting the absorbances of a series of standard solutions against the corresponding concentrations, thus giving a calibration curve. The concentration of phosphate in the unknown sample can then be determined from the graph. In this exercise, a sample of natural water has been provided which has been filtered and treated to remove all materials likely to cause interference. 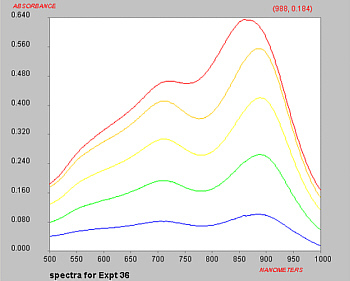 You are required to determine the phosphate content of the sample in duplicate, using the spectrophotometric technique outlined below. Prepare a standard stock solution of phosphorus of approximately 100 mg P/dm3 by dissolving 0.11g of KH2PO4 (this should be accurately weighed) in distilled water and diluting to 250 cm3 in a volumetric flask (Stock Solution A). Accurately transfer 10 cm3 of this solution to a 250 cm3 volumetric flask (Stock solution B) and make up to volume with distilled water. Use stock solution B to prepare standards of approximately 0.20, 0.40, 0.60, 0.80 and 1.0 mg P/dm3, that is, pipette 5, 10, 15, 20 and 25 cm3 portions respectively to separate labeled 100 cm3 volumetric flasks. Place roughly 50 cm3 of distilled water into a 100 cm3 flask as a blank solution, then organize all the analytical solutions for colour development. Do not make up the solutions to the mark yet. You are provided with a water sample that has been diluted by a factor of 10. Pipette duplicate 25.0 cm3 portions of the diluted sample to two separate 100 cm3 volumetric flask, then develop the colour as outlined below. Add distilled water to all the analytical solutions (standards and samples) so that each flask contains roughly 50 cm3 of solution. Starting with standard 1, add 13 cm3 of combined reagent using a 25 cm3 measuring cylinder (Note 1). Shake thoroughly and make up to the mark with distilled water. Treat all the solutions similarly then allow 30 minutes for colour development. Prior to measurement, set the wavelength of the instrument to 880 nm then zero with distilled water in a 1-cm cuvette. Measure the absorbances of the standards in order of increasing concentration followed by that of the sample solutions. Record your results in the table provided then plot a graph of the corrected absorbance vs the corresponding concentration. Complete the exercise by answering the questions and performing the calculations on the laboratory worksheet. 1. Combined Reagent: Prepared by combining 500 cm3 of 2.5 M H2SO4, 50 cm3 potassium antimony tartrate solution (i.e. prepared by dissolving 1.371 g K(SbO)C4H4O6.0.5 H2O in about 400 cm3 distilled water and diluting to 500 cm3) and 150 cm3 ammonium molybdate solution (20 g (NH4)6Mo7O6.4H2O in 500 cm3 of water), 300 cm3 ascorbic acid solution (made by dissolving 5.28 g of ascorbic acid in 300 cm3 of H2O). The solution is thoroughly shaken and stored in plastic bottles. A fresh mixture is made on the morning of each lab day. Copyright © 2002-2011 by The Department of Chemistry UWI, Jamaica, all rights reserved. Created Oct 2002. Links checked and/or last modified 14th November 2011.